Published by Stoimen Veselinov in Metrilo Updates and News. 2 mins to read. We’re so damn happy to give all our users a completely new feature that directly helps improve the shopping experience, retain customers and convert more. 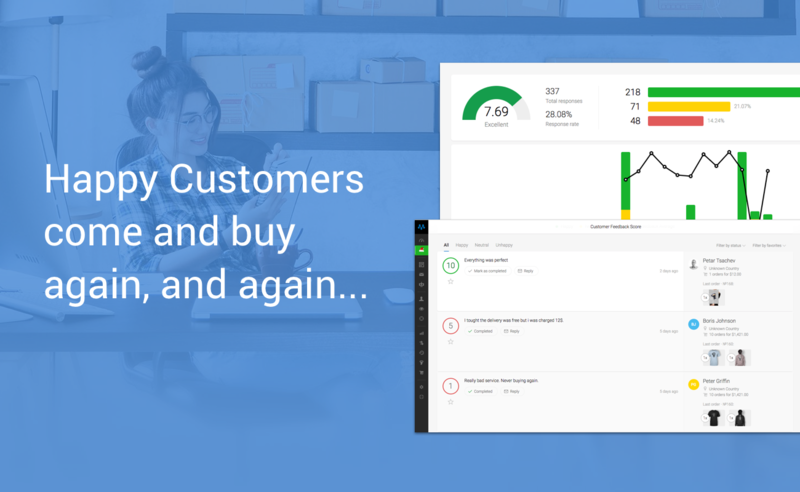 The Metrilo Customer Feedback Score for online stores measures how satisfied customers are with the shopping experience you provide. It helps you identify issues and address customer needs. This way, you improve your conversion rates and increase customer loyalty. We wanted it to be something that gathers this feedback for you 24/7, so we made it an easy-to-use feedback form. It’s the question, “How likely are you to recommend our store to a friend or a colleague?” in a pre-set block with a 0-10 scale. When customers get the message, all they have to do is click on a number on the scale. This automatically opens a text box with a prompt to explain why they picked this number. This way, you get context for the score in the customer’s own words. All this data goes into a dashboard in the new Customer Feedback tab where you can see what each respondent said (and their last order) along with the calculated score out of all responses. Those labels make it even easier to evaluate the score you have. Of course, you’ll see metrics like response rate and trend over time too. Use it as research to see what people want – new products, more options, assistance, faster delivery? Learn more on how to set up the customer feedback score. Now, go ask your customers what they think about shopping from you and get improving! Stoimen is our Customer Happiness guru. Advises customers on how to make the best use of Metrilo for their marketing and plays table tennis in-between. A mountain lover and a chess champion.